Valentine’s Day is here and couples everywhere will express their love with a quintessentially romantic heart-shaped box of chocolate. And that’s a great thing because chocolate is not only good for your soul, it benefits your mind and body as well. There is no doubt that eating chocolate is undeniably gratifying. Chocolate has what food manufacturers call the “bliss point,” or that pleasurable sensation that occurs when chocolate melts in your mouth, activating brain receptors that can boost mood and ease stress. One of the great things about chocolate is that you don’t have to wait for Valentine’s Day to receive the benefits, as long as you eat the right kind of chocolate and don’t overindulge. A bit of chocolate can be eaten every day, as a small amount of chocolate is all it takes to receive the naturally occurring compounds that can benefit your health. There is archeological evidence that ancient Olmecs of Mexico prepared a bitter drink from cocoa beans as early as 1000 B.C. The Mayan and later the Aztec elite believed cocoa had magical or divine powers and used cacao in sacred rituals and ceremonies. Flavorings such as chili peppers or flowers were often added to the bitter concoction. Cocoa beans were so valued that they were used as currency for several centuries. In the 1500’s Spanish colonization brought chocolate to Europe, which resulted in the addition of cane sugar to sweeten the drink and the addition of seasonings familiar to Europeans such as cinnamon and pepper. In the 16th and 17th centuries, wealthy Europeans drank hot cocoa for what was termed its “considerable and admirable” health benefits. It was believed that cocoa with its nutritious and medicinal properties could cause conception and facilitate delivery, cure consumption, obstructions, and fluxes and prevent infectious diseases. Cocoa as a health drink? Chocolate lover’s of today could buy into that theory. In 1828, a Dutch chemist named Coenraad Van Houten invented a method for making powdered cocoa by removing half of the natural fat or cocoa butter from the beans, grinding what remained and adding alkaline salts to cut the bitter taste. The result of this defatting and processing is known as Dutch cocoa. The remaining cocoa butter led to the creation of what we now know as chocolate. The modern chocolate bar was born in 1847 when Joseph Fry discovered he could make moldable chocolate paste by adding melted cocoa butter back into Dutch cocoa. Milk chocolate was first made in Switzerland in 1875 when Daniel Peter, a chocolatier, united cocoa and condensed milk creating an instant success. To this day, milk chocolate remains the most popular chocolate in the world. Chocolate manufacturing is now a 4 billion dollar industry in the U.S. and it is estimated that the average American consumes a half pound a month. However, not all chocolate is created equal. As chocolate candy became affordable, less cocoa butter and more sugar and additional ingredients were added to the bars, making chocolate decidedly less healthy. More recently, high-quality handmade artisanal chocolate has become popular, creating a chocolate revolution of sorts. To get the most health benefits, note that good quality chocolate has the highest percentage of chocolate paste and the lowest amount of sugar. Eating a proper amount of chocolate is crucial to receiving the benefits without the liability of added sugar and calories. Dark chocolate with the highest amount of cocoa butter, 60% or higher, provides the greatest benefits. Look for cocoa or chocolate liquor as the first listed ingredient and limit yourself to a few ounces a day. Because it’s rich in fiber, dark chocolate is more filling than milk chocolate and may even reduce the craving for sweet, salty and fatty foods. Healthy fats – About a third of the fat found in cocoa butter is oleic acid, the same heart-healthy monounsaturated fat found in olive oil. Another third comes from stearic acid, a saturated fat, that is converted by the liver to beneficial oleic acid. Flavonoids – Cocoa is one of the richest sources of flavonols and polyphenols, natural phytochemicals found in fruits, vegetables and tea. Flavonoids are powerful antioxidants that may help protect against heart disease and oxidative stress. Flavonols are also thought to be helpful in improving blood flow, lowering LDL cholesterol and raising the good HDL cholesterol levels. Amino Acids – Chocolate contains nitrogen rich compounds that support the body’s proteins and are precursors to dopamine, the feel good brain chemical. Numerous studies show that chocolate may help reduce blood pressure by widening the arteries, improve insulin sensitivity by increasing nitric oxide production, reduce the risk of stroke caused by clotting and boost blood flow to the brain, improving cognitive performance. So enjoy that box of chocolates this Valentine’s Day and all the other days too. After all, no other food quite compares to it. There appears to be good reason why the scientific name for chocolate is Theobroma cacao, which literally translates as food of the gods. Chocolate lovers of the world would agree. 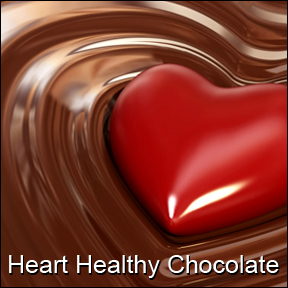 This entry was posted in Health & Wellness, Home and tagged Heart Healthy Chocolate, Professional Supplement Center, Vitamins and supplements, www.professionalsupplementcenter.com. Bookmark the permalink.